Hi Sylvie....I just love the image on your card.. Pink and black is so stunning together. Another lovely card Sylvie, I'm so glad your LIM cards were popular at the sale! Wow, what a lot of comments you had. Wonderful! See you next time too! 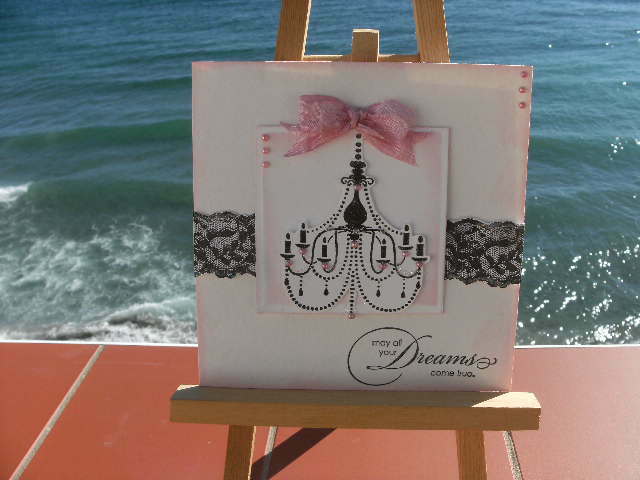 Stunning card Sylvie, so romantic and I love pink and black! Beautiful card, I have just made a chandelier card for my sister in-law, still thinking about the pastel challenge though. Beautiful! Lovely colours and so elegant. Fabulous card. Love the image and the pairing with the lace is a great effect. Sylvie, this is GORGEOUS! I love that chandelier stamp..and adding the pink with it is awesome!! Very pretty card, well done. Oh! my goodness you "do" beautiful cards, love this, the lace is a perfect addition. Wow! This is superb! That image is so stylish and the lace suits it perfectly. Hmmmmm...rather jealous of that beautiful ocean in the background. Wish I was there. Hi Sylvie, how you doing? its so lovely to see your beautiful card, love it. wished I was were you are today, its really horrible and grey here just no signs of spring weather here. Love it Sylvie! Oh and look at that sea - no wonder you are making such beautiful cards in a setting such as this! Your card is so swish. Sylvie, I ADORE this card..perfect! What a gorgeous creation I love it. The lace stamp is stunning as is the whole card! So pleased that you sold some cards at the craft and collectors fair - it makes you feel good doesn't it when someone buys your makes! I'm not surprised your cards are selling - they are gorgeous! This one is no exception so feminine and dramatic! Pink, black and white is a very classy combination. The lace and chandelier work together also.